TPC Overall Rank: #55 out of 2933 rides. In User Top 10: 97 times. User Tracker Count: 170 times. 1st Drop On The P.R. Very disappointed t was a little to rough.Like it when it went through other coaster. What a punch! This is a really good coaster. I didnt like the first drop and it actually was a bit rough, but the second drop was just as good as everyone has said, as it launched me way out of my seat. Afterwards came a powerful helix and then many intense bunny hops giving incredible air. So why a 9? Its way too short. The day Kennywood announced that Steel Phantom was going to be modified shocked me and needless to say I was furious. Anyway, the day Phantoms Revenge opened I was at Kennywood ready to ride Morgans new creation. I was shocked by how much more I loved this thing. The first drop gives incredible laterals and the second drop, well that gives absolutely incredible ejector air and at the bottom the Thunderbolt headchopper always gets me. As for the rest of the ride, it is unbelievably fast. There are tons of air time hills that give air time on steroids and the turns give incredibly strong Gs. Excellent hyper coaster that was a great replacement for the Steel Phantom and one of the best coasters anywhere as well. The trains were very comfortable and the first drop gave good laterals and the straightaway gave a great sense of speed. The following hill gave some air time for front seat riders and then came the legendary drop and I was completely ejected from my seat the whole way down. At the bottom was an incredible headchopper followed by a huge turn. Following that were a series of insane air time hills that completely ejected me from my seat. I really dont like saying that the best ride at a 109-year-old park is the most modern coaster there, but in Kennywoods case, it is very true! Phantoms Revenge met my high expectations. I dont want to say they exceeded them, because a ride that is constantly rated as one of the top 10-20 coasters in the world is expected to be great. The lift was really nice, because it was so slow compared to modern lifts, and really helped build anticipation. The first drop was honestly very shaky. It felt a little uncomfortable, not bad, but certainly the worst first drop on any hypercoaster Ive been on (which I guess is to be expected from 1991 Arrow). Ive heard some great things about the second drop, and I think the over-hyping of this drop caused it to be a bit of a disappointment. I remember seeing it from the queue line, how extremely long and straight it looked. I couldnt even see the end of this drop, due to the dark October night of the Phantom Fright Nights, as it seemed to just disappear under the Thunderbolt. I dont know what I really wanted from this drop. I just thought it would go a little bit more under the T-Bolt than it did. It seemed to end after the intersection, and I expected it to continue forever. Oh well, it was fast, provided a hint of airtime at the top, and also gave a brief moment to catch your breath at the top and anticipate what was coming. That is actually the most frightened I have been on a coaster for a long time: sitting in the second to last row of Phantoms Revenge at 9:30 at night ready to undertake one of the most historic drops in coaster history Ah, yes, good memories, but SOMEWHAT disappointing. Not the greatest drop ever. The helixy turnaround was very reminiscent of Steel Forces: going at a very fast speed with air blasting in your face like crazy. The best part of PR is definitely the small bunny-hops that follow this turn-around. This is the most consistent display of powerful airtime I have experienced on a hypercoaster. I still think that the few great camelbacks of SFAs SROS make for a better ride, but PRs packed a huge airtime punch. They were almost violent, going over small hills at very high speeds, but were just really, really good. There was even good air on the hop to the final brake run. Let me also say that Steel Force actually had more wiggle room for me, however PR, had much more powerful ejectors. This is most likely because of PRs lack of any mid-ride brakes (to my knowledge), and I have to say I like Phantoms air better than Pennsylvania’s other set of Morgan-engineered camelbacks. Phantom’s Revenge has the kind of layout that really gets me excited: slow, anticipation-building lift-hill, an okay first drop, followed by an improving middle and an absolutely incredible airtime finally. As I said before, there is airtime up to the final brake run. A ride that starts off shaky is okay by me, as long as it finishes strong. This is an awesome ride!!!!!!!! Very fast and lots of airime. It makes you want to jump right back in line! It is a huge improvement on the Steel Phantom. I can not wait for Kennywoods next coaster. Good roller coaster. Its probably the best ride at kennywood. This ride was amazing!!! although when i was waiting to ride for the first time this summer i didnt think it was going to be that spectacular. but that second drop "the Gigantic One" i call it was spectacular. You can get great airtime even in the front row of this coaster. the lap restraints are cool too because they alow you plenty of out of the seat action. when i rode in the very last row i was literaly standing up in my seat on the second drop. Well done Kennywood!!! The Steel Phantom was just another example of the works of art that Arrow Dynamics was able to produce for our ridding pleasure. This Black and White tracked monster was the first Hyper-Looper built by Arrow in 1991. 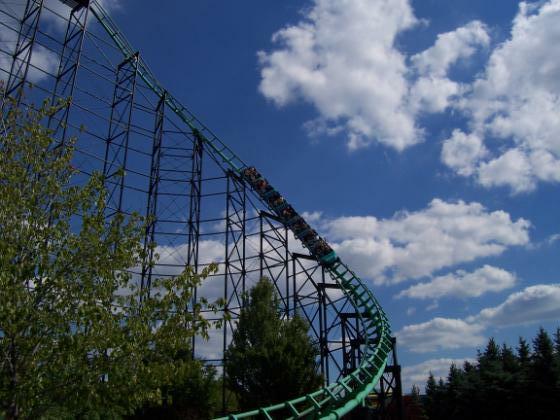 With its massive lift hill and swooping right turn drop, to the strip of speed track at the bottom, to the massive second hill of 225 feet, which was what made the Steel Phantom what it was. Fallowing were two of the most perfectly placed inversions of any coaster I have been on to date. A loop taken at a reasonably high speed for an Arrow and a Batwing that was not for the faint of heart, a swooping turn into a high speed corkscrew, a helix then onto the break run. What was what made me love Steel Phantom so much was like it was so great to look at, it was so graceful looking. I will admit the ride its self did get rather rough for my taste, but if you held your head back it was no problem. The Steel Phantom was a work of art created by Arrow, Destroyed by Morgan. , this is just painful. is the original Arrow section. I am sorry if this ruffles and fan boy feathers, but its just a shadow of what the Steel Phantom was. Phantoms Revenge is, first a foremost, a great testament to the fact that old, outdated coasters can be revitalized and given new life with some fairly basic modifications and still be great. While I never got to ride the old Phantoms Revenge, it was quite the coaster in its day, and from all accounts the Phantoms Revenge is an improvement over the other, so I can imagine why the original had the reputation that it did. Phantoms Revenge is a very unique coaster with an even more unique placement. The ravine that helps make this coaster, and park, famous still favors heavily into the layout of this coaster as it did in its previous incarnation. The station features some nice views of the ravine, and the land going all the way down to the Monongahela River below the park, as well as the town and factories on the other side of the river. The actual ride begins with a nice, slow, and long lifthill as only Arrow can provide. Upon reaching the top, you drop quickly and pick up a surprsing amount of speed given that the hill is only about 150 feet tall. Blistering through the straightaway, you then hit the 2nd hill, turn about 45 degrees to the right, and then drop way down into the ravine, knifing through the Thunderbolt on the way. Upon reaching the bottom, you fly back up and around through an awesome helix turn before diving back up through the Thunderbolt on your way back up to station level. However, dont think that the ride is over yet. As you draw near the station, the first of several wickedly intense bunny hills hit you, thrusting you into your lap bar, only to be pulled back down again. For the rest of the duration of the ride, the Phantom has you on marionette strings, as he repeatedly pulls you up before throwing you back down again. Finally, you are thrown through one last hill before slamming on the brakes outside the station. Not a coaster to mess around, this monster is intense from start to finish, and the massive speed felt from the get go (after the lift hill, at any rate) is kept up for the entire ride. I rode twice, once in the very back and once in the very front, and this is one of the few coasters where I highly recommend riding towards the front rather than in the back. The airtime is just as intense, but not as rough since you can anticipate it better, and the speed and wind that you get in the front is an absolute rush (literally). This coaster is a great contrast to a B&M hyper - rougher, but also faster and more intense. Highly recommended.